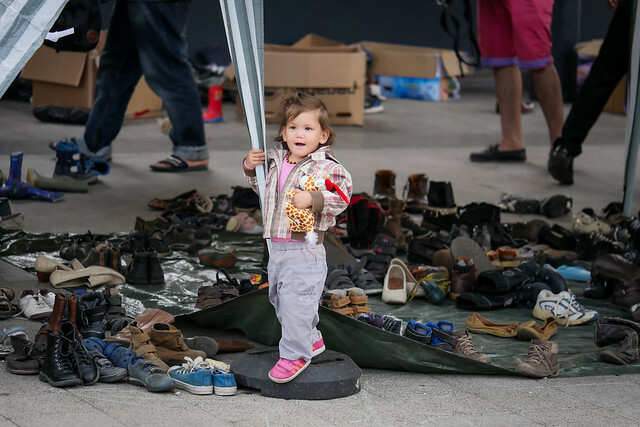 Changes have been very fluid this past week in Hungary with the refugee situation. 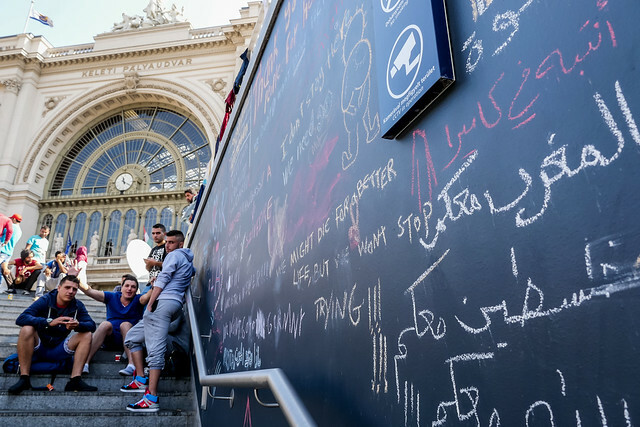 Last Monday, Sharon and I went into Budapest to help at the Keleti Train Station which had been jammed in the past with crowds of refugees. Above: Above, the upper level of the Keleti Train Station in Budapest. 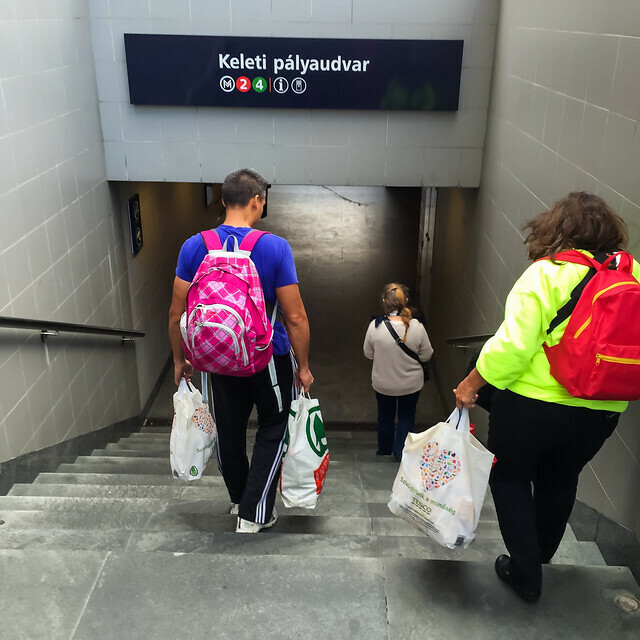 Cutting through the train station and heading to the lower level we found that there were hardly any waiting. We passed a line of police officers and a designated path just for refugees to quickly board trains and exit Hungary as soon as possible. 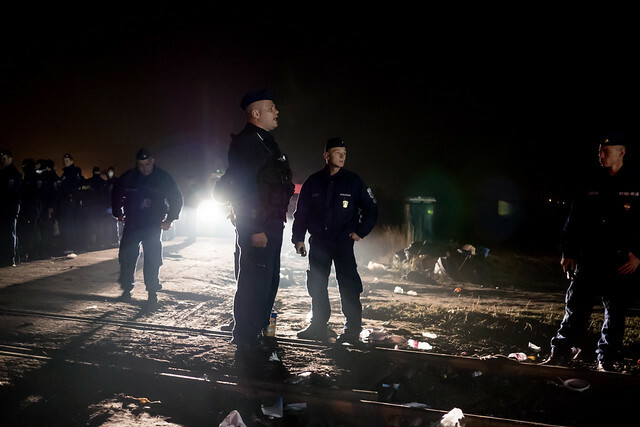 This was all due to upcoming changes that happened last night where Hungary finished locking down it’s border and declared a state of emergency with much stricter and immediate consequences to those who cross the border illegally. 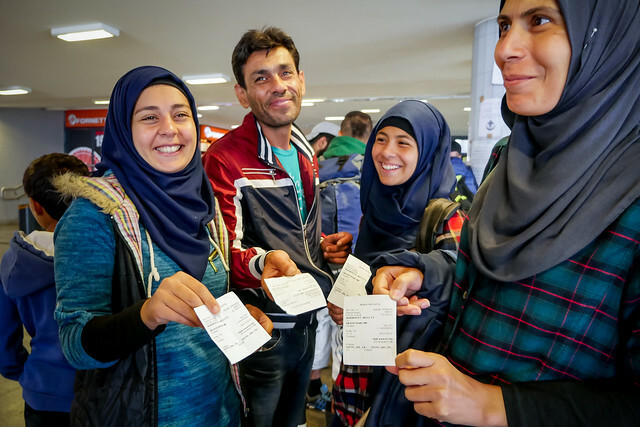 Above: A small group from Syria joyfully showing their tickets to a train that would take them to the border of Austria. Above: As we walked around, we found a man laying down with shoes off and I struck up a conversation with him. 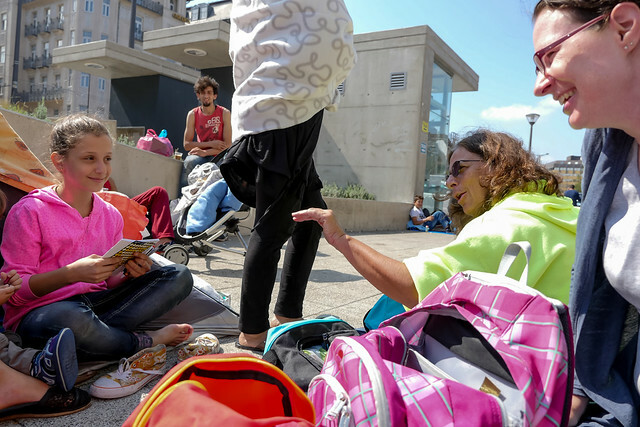 Unlike the masses who were arriving and immediately leaving on trains, he was waiting for the rest of his family to arrive on busses since they had been separated at the Hungary Serbia border. Once they arrived they would also board the train and make their way to Germany. It turns out that this man was a middle school teacher in Syria. It is amazing how much we could communicate with his limited English and using make-shift sign language. He allowed me to pray for head pain he was experiencing and Jesus was merciful to heal him. He gladly accepted a few bananas and also some homemade cream that he applied to his worn feat. We gave left over supplies to another non-profit organization as we had to head back home to get Ziva from preschool. This just shows how quickly the crisis is shifting and how needs are hard to pinpoint with all the change happening. We are currently discussing ways in which our mission agency can best contribute with the donations we have already received and how to use the personnel that have time outside of their existing ministries to help. We appreciate your continued prayers! Above: Roger getting back to teaching ESL with returning students and thankfully many new faces in Jászfényszaru. Above: Dezso, who we first met though an English club in our hometown in Petofibanya more than ten years ago has since become a elder in our church plant and serves with us now in Jászfényszaru with his giftings in evangelism. 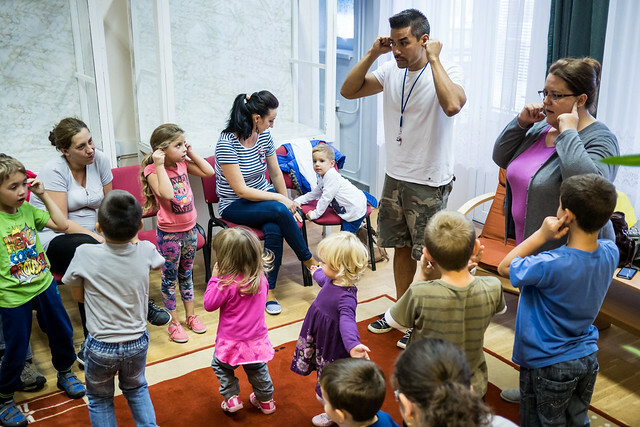 On Monday, we relaunched our English Club in the town of Jászfényszaru. We have been working in this town for a few years with a desire to see a church planted. Our first hour is divided into two classes, with a beginner class for adults and a new class for pre-schoolers and younger children. Our next two hours are for intermediate and advanced students and it is in this time that we hold two separate Bible studies. We were grateful for the turn out and especially those who attended the Bible studies. As many of you know, last semester Bogi was one of our students from Jászfényszaru who ended up putting her faith in Jesus over the summer. We hope to see this time and time again as we sow seeds of the Gospel in this town. Above: Brenda’s beginner English Bible study. Above: Our advanced class from left to right: Hanna, Bogi (recently saved) and Kati who is works facilitating the programs for the local community center. In my advanced class, I had a new student, Hanna who had just moved to Jászfényszaru a few weeks ago. I was thankful for how the class made her feel welcome right away and how she was involved in our Bible study on Jesus meeting the Samaritan woman at the well. As we discussed the life of the Samaritan woman and her needs, Hanna commented that she heard somewhere that all of us have a void in our heart that only God can fill. It was clear that the Spirit was already helping her to see what Jesus was offering those who come to Him. Please pray for Hanna and students in Brenda’s English Bible study to come to know Jesus through His Word. 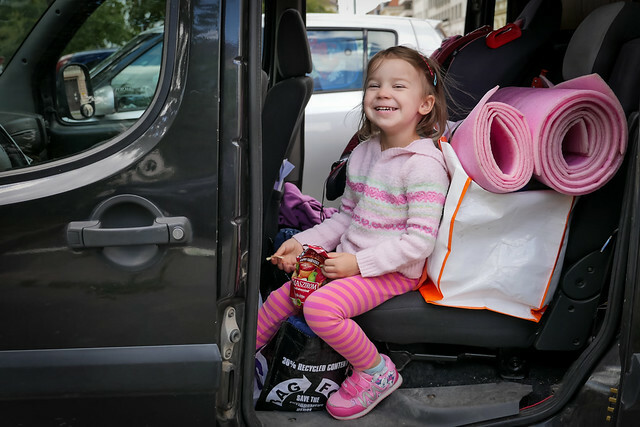 On Tuesdays, we continue to commute to the town of Bogács reaching out to the Romani tucked away in a ghetto area of the town. 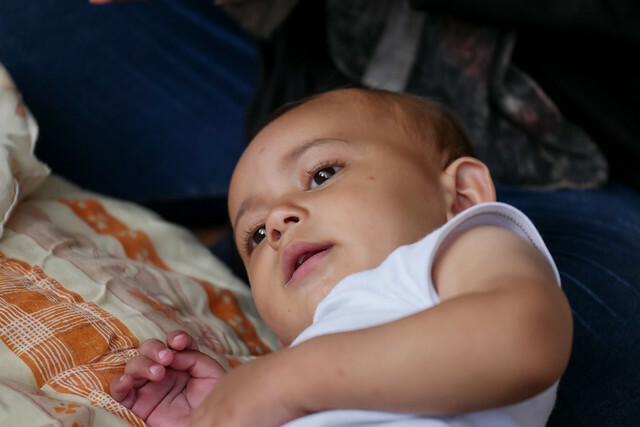 Erika, who was baptized a few weeks ago continues to grow in spite of great difficulties and challenges because of poverty. Sitting around a dimly lit kitchen table, she began giving testimony about how for the first time she is experiencing freedom from the power of sin in her life. She said looking back at who she was and how she lived, she just doesn’t know where she would be today if she didn’t meet Jesus. Her friend Edit continues to be hesitant because of the past influences of false teachers. She just doesn’t know who to believe. It has been our goal to help her to read the Word and use it to discern who is telling truth. Every week she has new questions and I simply bring her to the Word and we read it together seeking answers. This week we focused on Scripture that revealed that Jesus was God in the flesh. Please pray for more to come to know Him in Bogács and for the young believers to grow in discernment and in the knowledge of God’s love. Over the past few months, God has been bringing families into our church that have been in the crowds where we have scattered seeds of the Gospel in the past. 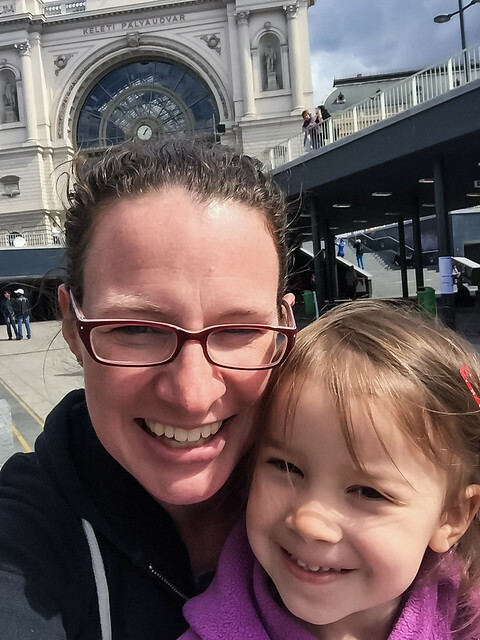 Zsuzsa had two of her children attend our English Camp. In a terrible turn of events in her life, she fell into desperation and began truly seeking answers. Since she has had spiritual conversations with us in the past (and because she is our town’s postal worker) she began hearing again from multiple people from our church the hope we have in Jesus. Instead of going to her door, she (in her normal course of the day) would come to our door. Soon after, she put her trust in Jesus Christ and is planning on being baptized along with many others (including our daughter Elianna) next week. 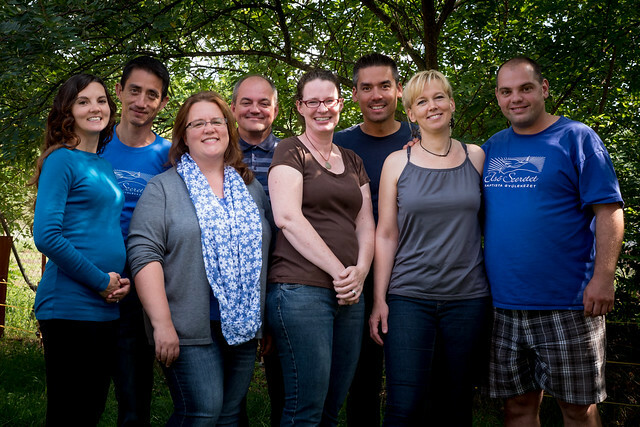 Above: Our core church planting team with Heidi and Roger, Brenda, Dezso, Sharon and Allen and Erika and Miki. 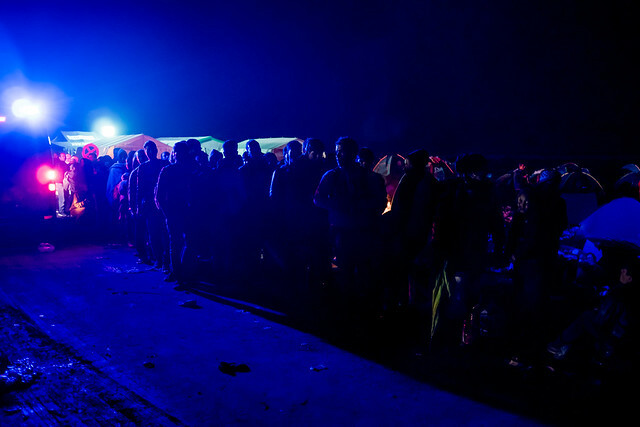 On Friday night, I set out to join other Christian volunteers at the border where Hungary meets Serbia. 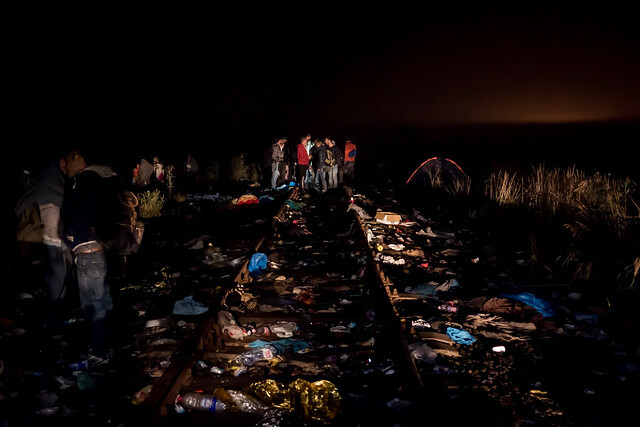 This is one of the major routes where refugees have been entering Hungary as they flee war in their home country. 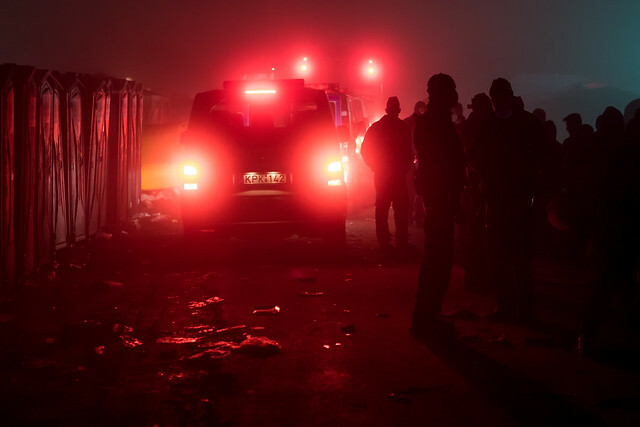 As we came closer to the border via highway in the dark of night, you could see a hazy orange glow in the direction of the makeshift refugee camp. Tonight, we partnered with Operation Mobilization (OM) and planned to be in their tent they had set up the previous night. Our initial entrance into the area was blocked as police informed us that this would be the main route of buses going in and out all night. 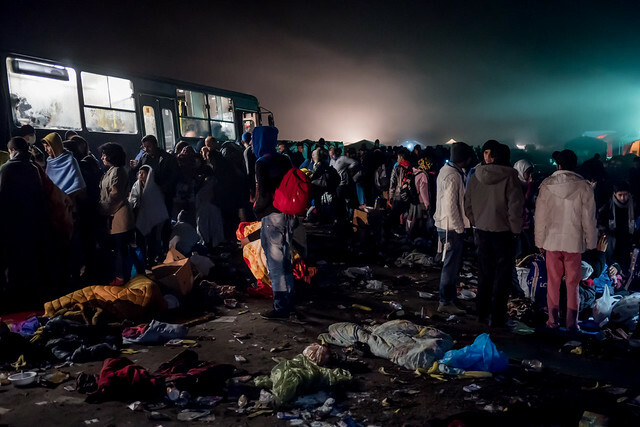 In previous nights, refugees were crossing the border at night and would have to stay over night before transportation was given to the official processing center. 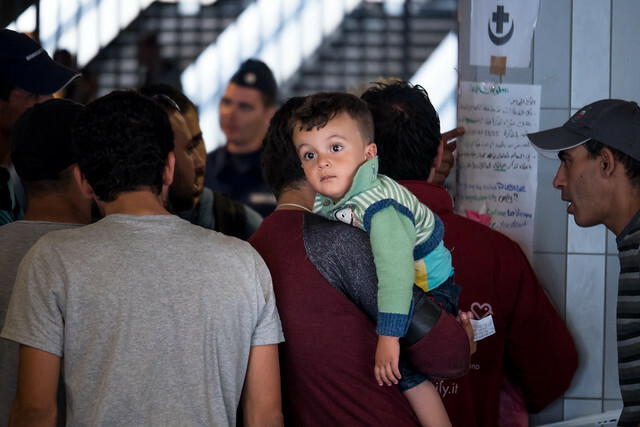 As the deadline for new stricter laws for incoming refugees is set to change Wednesday, it was clear they expected more to be crossing over in mass and needed to process them more quickly. We took a back way to weave our way toward the camp area. 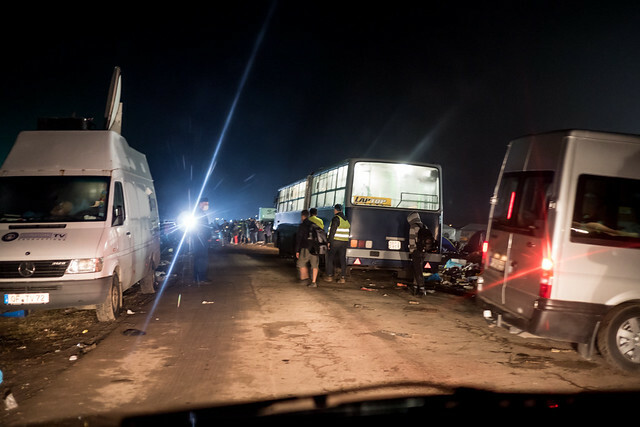 It was there that we passed a gas station where groups of vehicles lined up to smuggle refugees exploiting their needs and asking a high price. Moving on, we finally approached our destination. 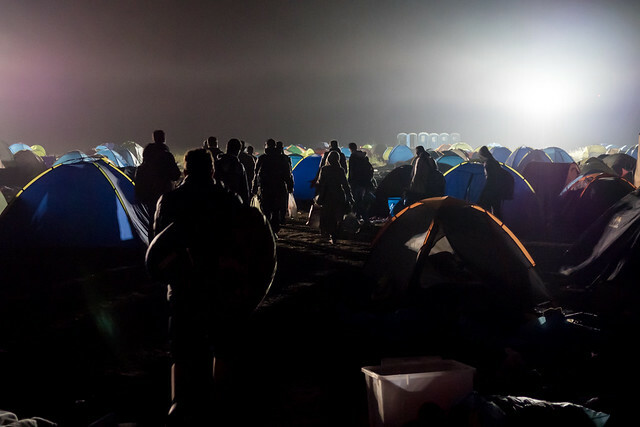 We began to see groups of refugees walking away from the camp. We began seeing piles of abandoned supplies, clothes, tents and trash. We made our way to the OM tent maneuvering on muddy ground through piles of supplies. 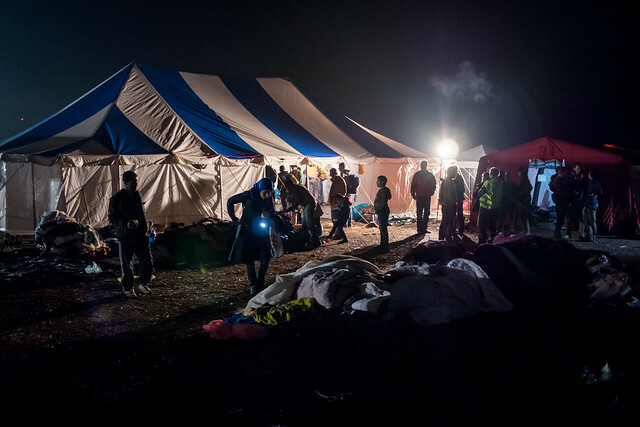 Thankfully, there were far more volunteers this night with larger tents from various organizations set up on the main road that approached the railroad tracks that refugees used as the entrance to Hungary. 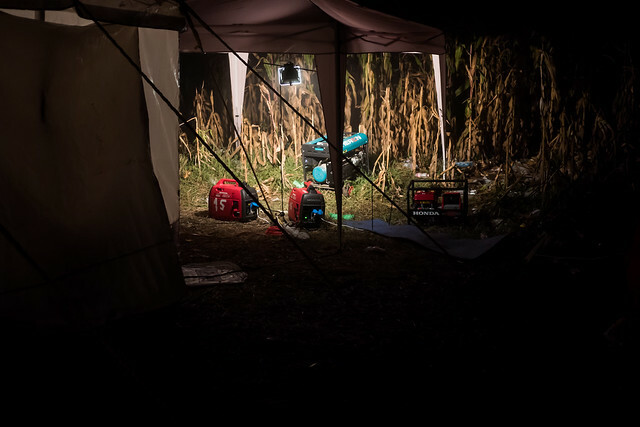 Above: Relying on generators for power for lights and to heat water for the night. Above: The blue and white striped OM tent would be our distribution center for the night. 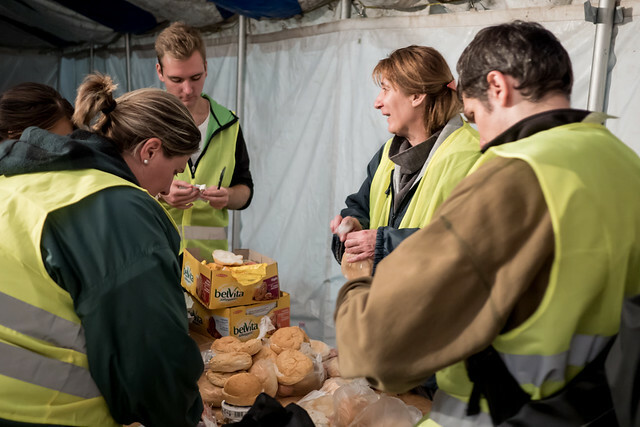 Above: Volunteers making simple sandwiches for those coming in through the night. Praise God that there was no rain and the weather was warmer than the last few nights. We began unloading supplies and the ministry began of just helping where you saw any need. 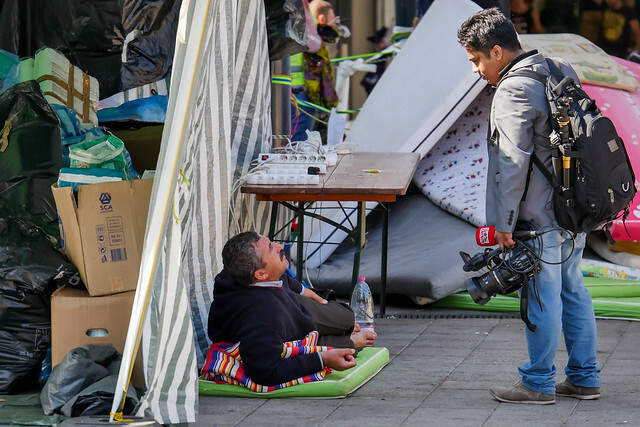 Sometimes that was just lifting something heavy, or shining light on piles of clothes so that refugees could get a better look to find what they needed. Sometimes that would be serving hot coffee and tea and expressing compassion and praying for those who are in despair. One man I talked to had just crossed the border and anxiously asked, “Where are the busses taking the people?” The last time he was put on a bus, he was thrown into jail. He told me how much he loved Syria, and was so broken about the war. As he talked to me, he would often pause trying to contain his sadness and looked in shock. He allowed me to pray for him and expressed his gratitude for our kindness. Another man that I spoke to was with his family in the OM tent. All of his family was sleeping but he remained awake. When I continued to encourage him to get some rest and that he was safe here, he said, “I no sleep for 5 days. I walk and walk.” He pointed to the group laying on the floor, “This my family. This my friend. I no sleep. Security. 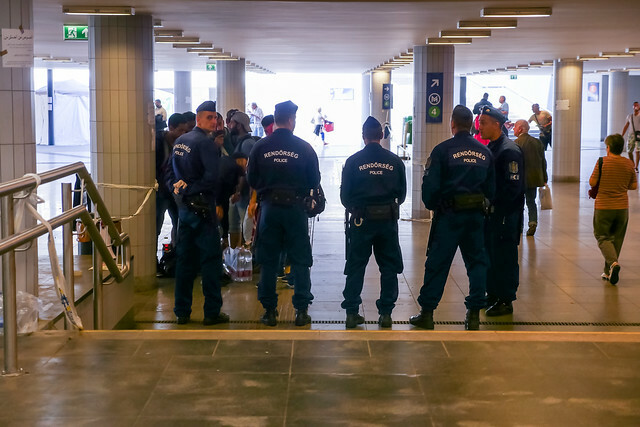 Security.” I can't imagine the state of their bodies and the amount of stress they are under. One of his family members was this small child pictured below. He got our attention and said to us, “Picture, picture” as he was waking up and he gave him a bit of sugar in his mouth. God has not only put the refugees on my heart in these places, but also the police that are there to maintain peace and order. As I watch the news, the police are often given a bad wrap and the worst cases are shown as the only cases. I also sought this night to minister to them as well as the refugees. When passing by the officers, I would often say, “Thanks for your hard work”. They rarely receive encouragement. Above: A shot from the railroad tracks. 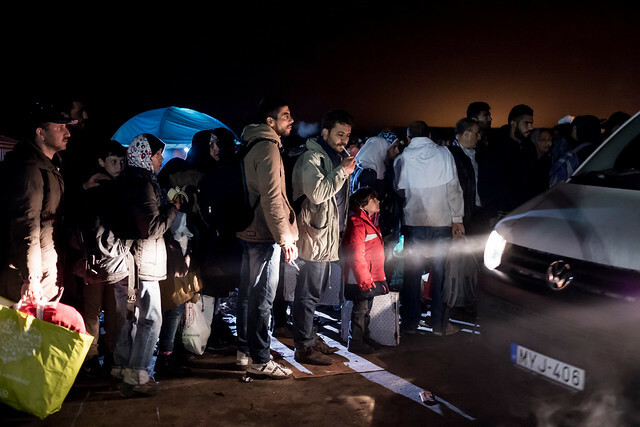 In the distance a new group of refugees arrives and in fear needs to be encouraged that it is safe to find some food, blankets and other supplies needed. 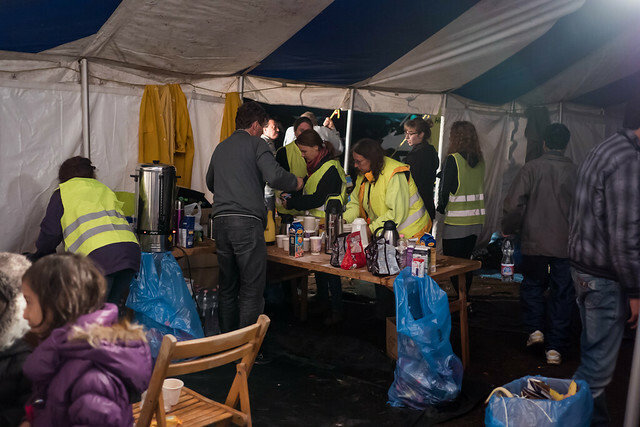 Later in the night, in small groups we would take out hot water containers and cups with premixed coffee to distribute where the refugees were lined up by police to be transported. The refugees were on our left in a tight line and the police on our right with their backs to the line of busses keeping order. 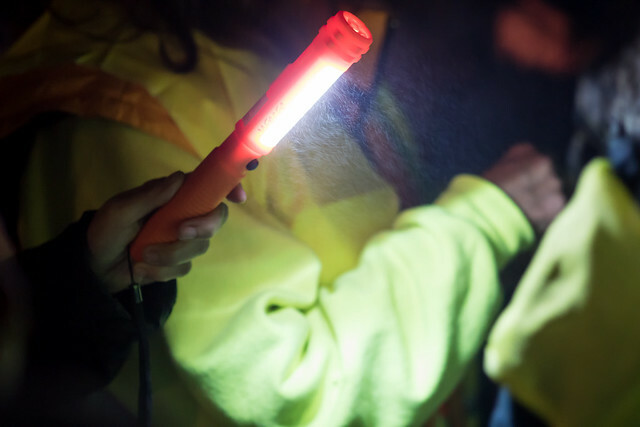 With a bright flashlight shining, it was as if we parted them walking in between and brought a bit of compassion to both the police and refugees as we moved through. 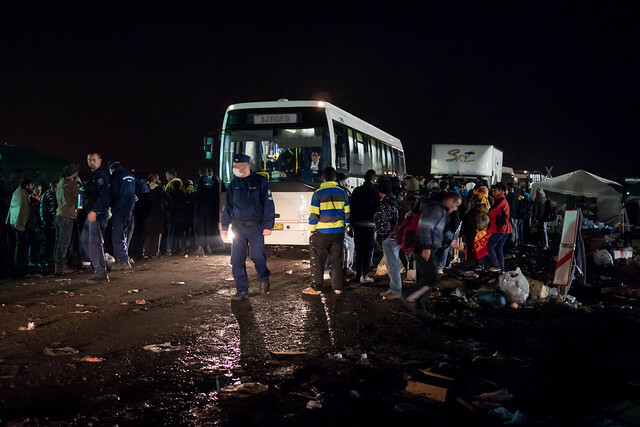 Buses continued to move the refugees out throughout the night as the number coming in died down around 3:00 am. We are not certain what will become of this crisis in the upcoming weeks and months heading into winter. We ask you to continue to pray. This is a great need and we as the body of Christ should be on the front lines helping. Please pray that this journey may be a journey where they encounter Him and His love and His truth so that they find citizenship in His kingdom through faith in Jesus Christ. 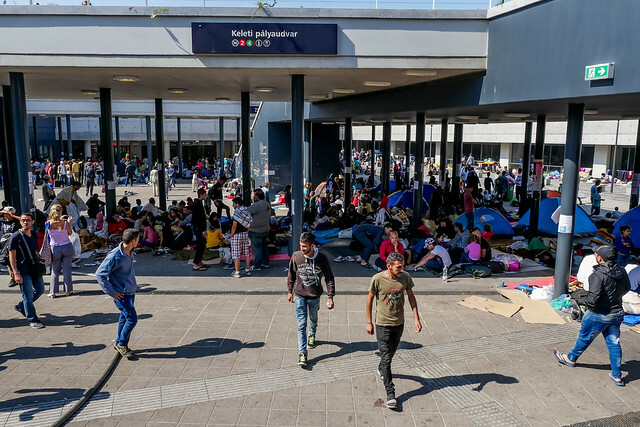 For those of you who have been following the news, you most likely have heard about the thousands of migrants flooding into Hungary from Iraq, Syria, Afghanistan and other nations over the past month. 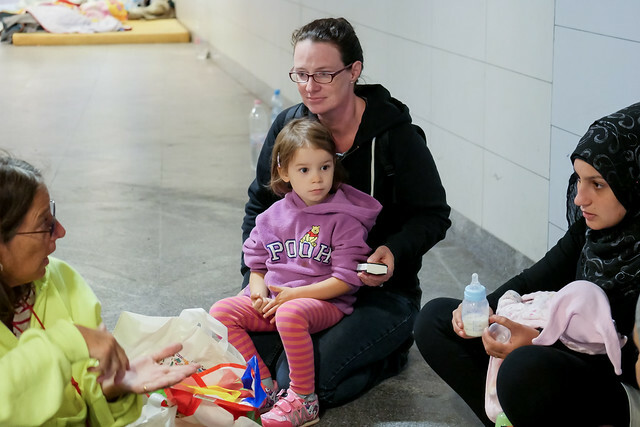 Last week, train stations in Hungary became make-shift camps as many waited for opportunity to board trains. 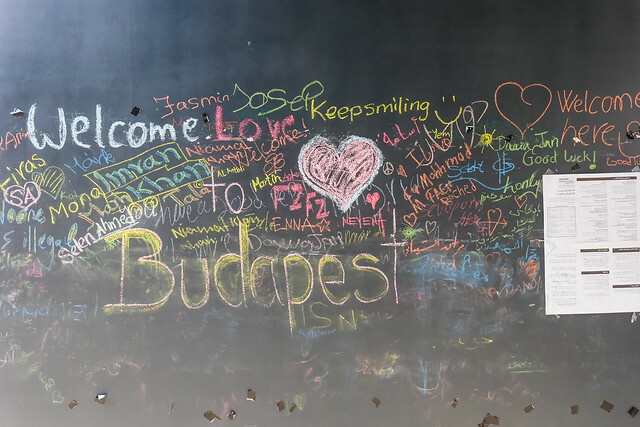 Many Christians in Hungary began responding along with various non-profit organizations to help alleviate the suffering as the build-up of migrants increased. 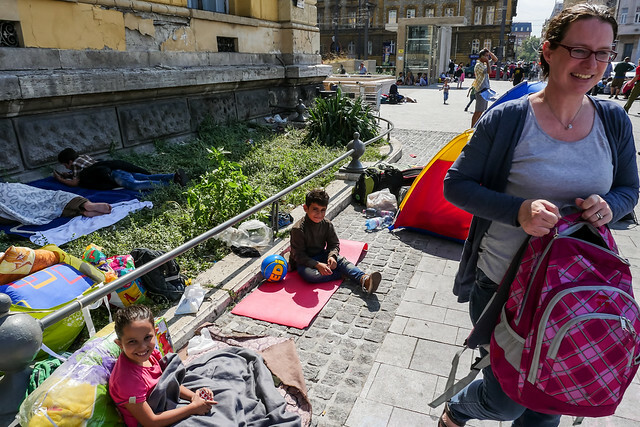 Our home and our ministries to Hungarians and Romani happen in villages and small towns outside the city, so we didn’t see what was transpiring first hand. Sharon began collecting some blankets and other supplies in our house that organizations were requesting for help. As Ziva stood by wondering what was going on, Sharon explained the situation in children’s terms. Ziva, in her three year old grown up voice said, “Wait just a minute mom, I’ll be right back.” She darted to her room and came back with the stuffed Elmo she has slept with for years and said, “Can you give this to them?” Generosity can be contagious and we’re thankful for God showing us what generosity is first through sending His Son Jesus Christ. The day before we commuted in to the city to help, our teammate Brenda had an opportunity to volunteer using her nursing skills. 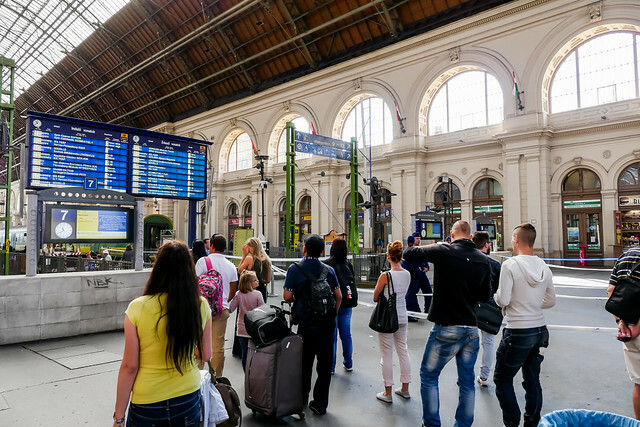 In the midst of the train station with all the noise, Brenda stood by a doctor who examined the woman who ceased to feel movement from her child. As she examined the pregnant woman, the doctor told Brenda, “I can’t hear anything.” Brenda asked if that was because of all the noise at the station or because there really were no signs of life. The doctor wasn’t sure and Brenda convinced them not to tell the woman until she had further testing at a hospital. Brenda then accompanied the woman to a local hospital and by God’s grace the child was fine! 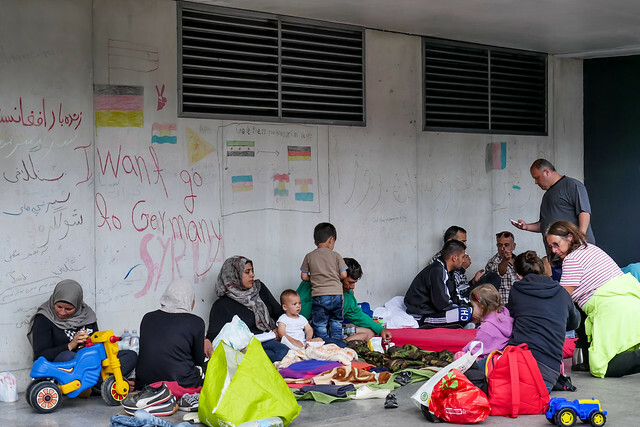 The next day Sharon and I commuted in to Hungary’s Keleti Train Station where thousands were waiting for trains to move them further into Europe. With the help of another PI member Val, we began distributing hot coffee, hot chocolate, and toiletries. 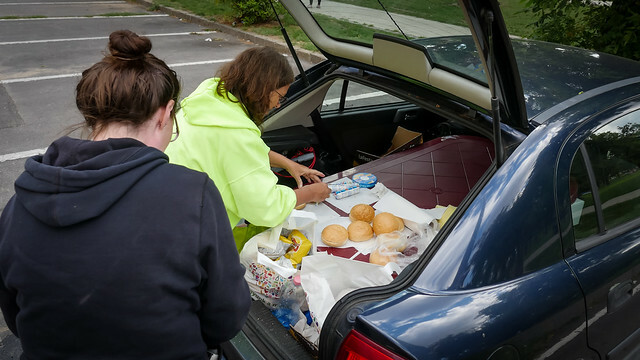 We found that having everything concealed and sitting with smaller groups helped to keep distribution from turning into chaos and allowed us to have brief conversations with those we met. 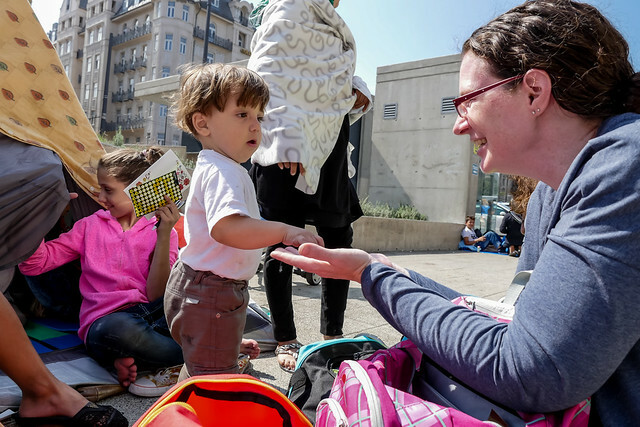 Above: Sharon was giving stickers, crayons and simple things to help the kids pass the time. God brought my attention to Deut. 10:17-19 before coming: “For the LORD your God is God of gods and Lord of lords, the great, the mighty, and the awesome God, who is not partial and takes no bribe. He executes justice for the fatherless and the widow, and loves the sojourner, giving him food and clothing. Love the sojourner, therefore, for you were sojourners in the land of Egypt. 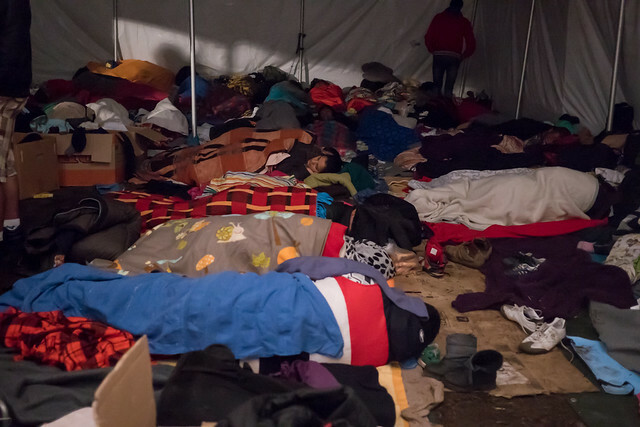 I also wanted to pray for the sick that we encountered as we wandered from tent to tent. I believe this is one of many ways to proclaim His kingdom and that He is risen. 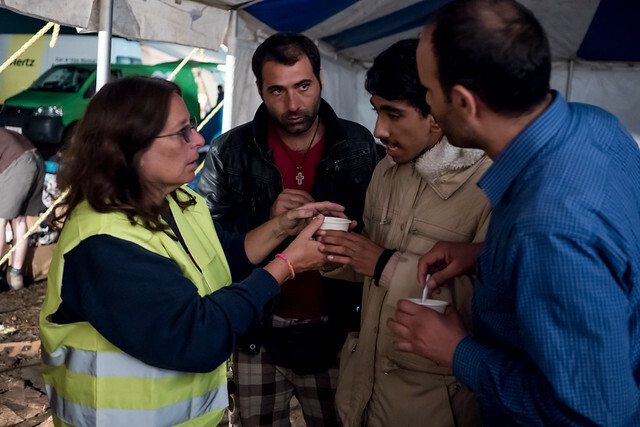 “He sent them out to proclaim the kingdom of God and to heal.” (Luke 9:2) After preparing coffee for a family under one tent, I inquired if anyone was in pain. One man removed his shoe and sock and pointed to a worn blister. I placed my hand on his bare foot and prayed for freedom from the irritation and Jesus removed the pain. As we wondered around and continued meeting more people, two women from that same tent sought us out and also asked for prayer. I think they did not ask for prayer initially because they didn’t know what to expect, but the man with the blister who was part of their group must have convinced them. Since there are more strict boundaries in their culture between men and woman, I had Sharon place her hand on the women as we prayed for Jesus to touch them with healing. One was holding back the tears with her lip quivering. 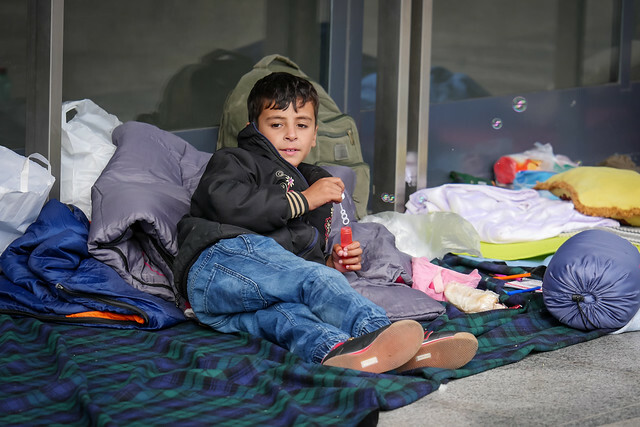 Many of these have been through terrible circumstances for months on buses, on boat, on foot and experienced their share of hatred and being disregarded as animals. But Jesus sent us to show them that they are highly valued and that there is hope in Him. It is my prayer that through this crisis many from these nations will be touched time and time again by ambassadors of Jesus Christ and His kingdom. 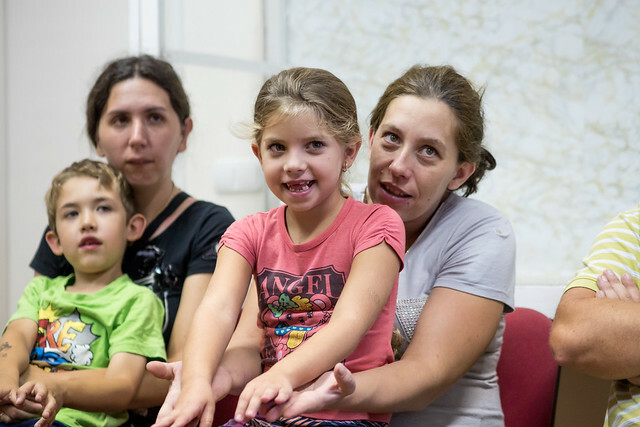 It is my prayer that they will find a new life, not in this world, not in a new country, but in God’s kingdom as His children through faith in Jesus Christ. 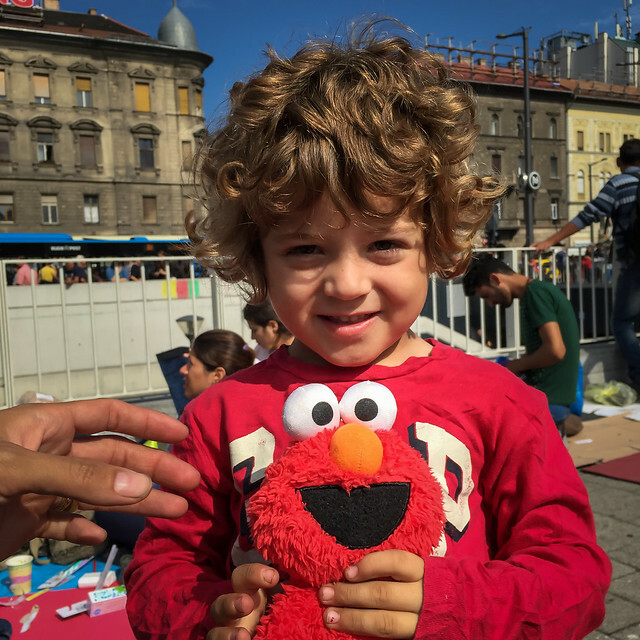 Above: The following week, Ziva also joined us as we mingled with migrants in limbo in Budapest. On this day we met a group of men from Iran who accepted our offer of hot coffee and other supplies. I was able to pray for one man who had some type of cough and congestion telling Him that I believe in Jesus. Earlier I had picked up some literature from OM in their native language to distribute which was helpful to get the point across. As the men from Iran read through the half page print out about our Father and His love, he said with broken English, “You Christian…. WE CHRISTIAN TOO!” We had been praying for sovereign appointments and this was surely one of them. Above: Reading through the evangelistic material (in their mother tongue) that we were able to distribute. As of today, it was clear that a large majority of those who were stuck were able to get to the border due to drastic measures taken to help. However, news reports reveal that these measures were only temporary and the crisis is surely not over. We expect another build up of migrants once again over the next few weeks. Although we can’t commit all of our time to minister in this crisis, we are seeking to do what we can. We continue to be involved in full time ministry in various villages and God is at work in so many ways. I’ll be reporting about that in upcoming updates. 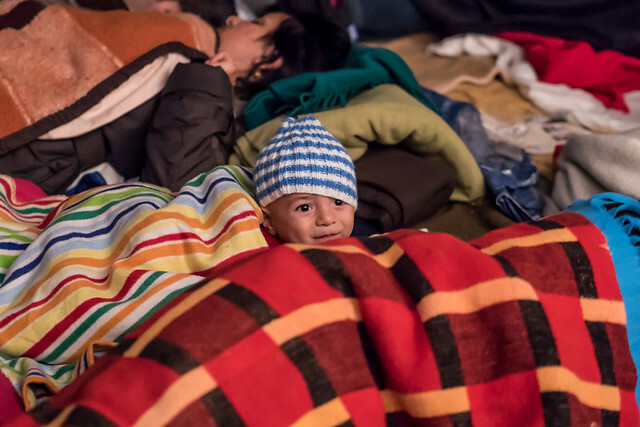 For now, I wanted to turn your attention to this migrant crisis so that you can join us in prayer. Leaders need wisdom to make unified decisions that will help. Volunteers need wisdom and provision to bless those who are passing through or stuck and waiting to move on. 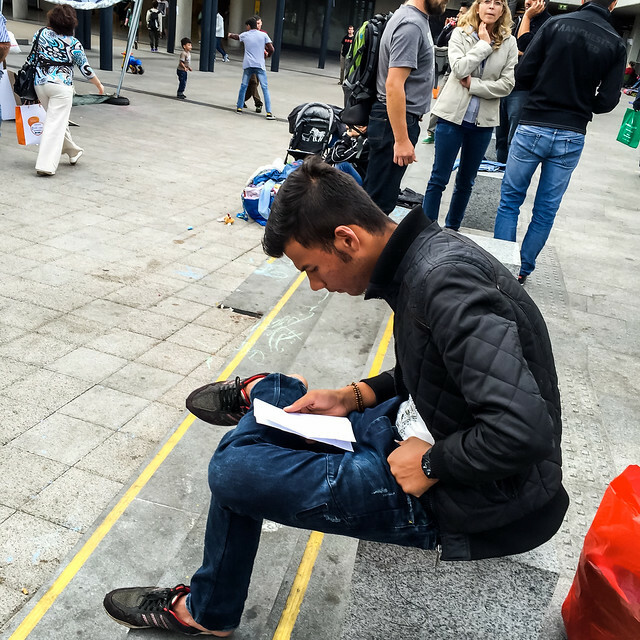 Pray that this path that these many individuals and families are on would be a path where they encounter Jesus and come to know His compassion and His Gospel.